Kalema Andrew Joseph returned to his native country Uganda in 2004 after graduating from EARTH. He began working with a program called Export Promotion of Organic Products from Africa, funded by the Swedish International Development Agency. As an assistant project leader with the program, he developed internal control systems for organic certification, built farmers’ capacity and conducted baseline and impact surveys of projects. He feels that he got the opportunity to work on the program in part because at EARTH he had learned how to do analysis, write effective reports and develop good presentation skills. When the program ended in 2008, Kalema began working with the Agro Eco Louis Bolk Institute (AELBI) and directed its East African office between 2010 and 2012); he continues to work for AELBI as a freelancer. 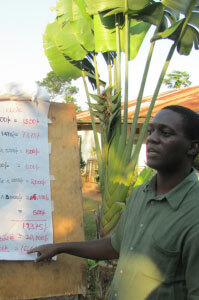 He is also an independent consultant and has continued to work with small-scale farmers engaged in various value chains. He organizes producers into groups, then associations and then links them to local and international markets. He helps farmers build capacity, improve management practices and increase productivity, and links them to financing institutions and donors. In the last seven years, Kalema has worked with over five producer associations (each comprised of approximately 650 farmers) that have all managed to export products. In 2009, he designed and implemented a successful pilot project benefiting two coffee producers’ associations and one cocoa association in Uganda. With funding from the Progreso Program, he promoted farmer-friendly technology for enhancing soil life and nutrition to boost productivity and product quality. How? He did so by teaching producers how to use microorganisms to make low-cost organic fertilizers (both solids and liquids) such as bio-ferments and bokashi. Since then, he has promoted the technology in Kenya and Tanzania, too. He has introduced it to coffee producer organizations working with non-governmental organizations (NGOs) such as Sustainable Harvest at Origin in Tanzania and Fair Trade Organization of Kenya. He also presented the pilot at a Sustainable Harvest conference in Arusha, Tanzania in 2011. NGOs’ excitement about Kalema’s work has grown so much in recent years that several in Uganda have contracted him to train other farmers’ groups. He is now promoting the technology in Ghana with two cocoa-producing farmer organizations.